It’s no secret that Colorado’s super delegates are coming under heavy fire from their left flank over their support for former Secretary of State Hillary Clinton, despite Sen. Bernie Sanders winning the state’s Democratic caucus 59 to 40. Congressman Ed Perlmutter, in particular, has even drawn a primary from a fervent Sanders supporter. The challenge clearly has the five-term Congressman taking notice because his campaign sent out an unusual letter defending his support for Clinton. 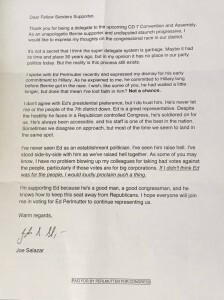 It was signed by state Rep. Joe Salazar, who opens by lamenting the super delegate system, going as far as to call it “garbage,” and expressing disappointment in Perlmutter for supporting Clinton. Salazar then pivots into saying that despite all that he hasn’t lost faith in Perlmutter and is still supporting him this cycle. But what is more interesting than the content of the letter is the fact that Perlmutter’s campaign felt compelled to send it at all. He must really be getting hammered to resort to the argument that supporting Clinton doesn’t make him a bad representative. It does, however, highlight how Perlmutter is supportive and representative of a broken and corrupt system. That’s what rubs people the wrong way, and that is why Perlmutter should be worried about his seat this year. Salazar is asking for Colorado Berners' support for his candidacy for a State House District. The question is: Who are you supporting for US Rep, Joe? : Perlmutter or his progressive primary opponent? The question is: what are ya gonna do if Clinton gets the nomination, Joe? I don't live in your HD but people who do might wonder. You gonna say or not? Salazar is asking for Berners' support for his candidacy for a State House District. The question is: Who are you supporting for US Rep, Joe? : Perlmutter or his progressive primary opponent? The question is: what are ya gonna do if Clinton gets the nomination, Joe? I don't live in your HD but people who do might wonder. You gonna say or not?